WayForward, the developers behind Lit and A Boy and His Blob, are working on a puzzle game for the upcoming launch of the DSi. 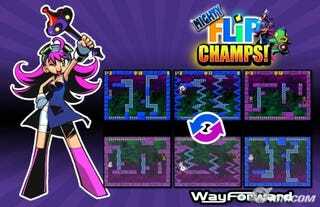 Mighty Flip Champs will be available through the DSi's download service as a DSiWare game. In the game players control Alta as she warps through a stack of levels filled with mazes. Alta appears in the top screen in her current maze while the bottom screen previews the next maze. To make it through the game, players flip through the levels trying not to crush Alta as the world around her changes.